Heating, ventilation and air conditioning, Variable Refrigerant Flow (VRF) technology does it all. 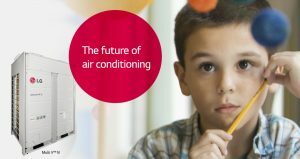 Prioritising room comfort, reduced energy consumption and lower maintenance costs, state-of-the-art VRF systems are designed to exceed all expectations. Created in Japan in 1982 by technological pioneers Daikin, VRF was a world first, using variable refrigerant flow to control cooling and heating…. EU Legislation on Air Conditioning could give Business Owners a nasty shock.